The Sierra Madre Tattler! 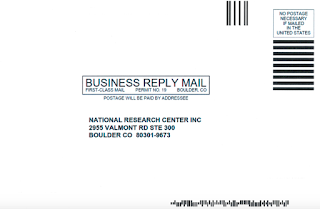 : The Library Survey Post Card Now Exists, And Here It Is! How will staying with the current Library limit services? Which services? Magazines and newspapers? Nix magazines, all program, and limit hours until all repairs are paid for. Put that money to repairs. Never sell property unless it is Goldberg Park. Yeah, sell the Sierra Madre Weed Patch and put that money toward repairs. Why not keep the current Library location and limit services. The Library has always drained the General Funds; so much overhead and zero being applied for retro fit. P.S. 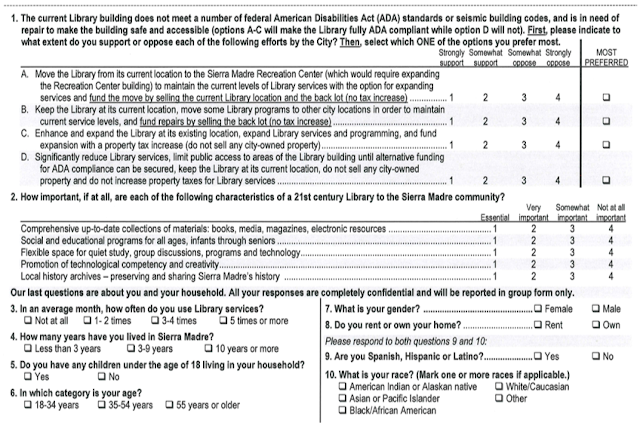 the library's budget was wasted on the contractor handling this mail in card survey already. Once again smart minds think alike lets take a survey to get the results, I wanted answers to steer the public taking this survey will validate? So much money was given to the Library over the years? How much of that money was really a slush fund after the Public Works department was identified as a department that money flowed in and out for other departments to tap? Never ever sell the land. Big mistake for the future. I am not sure the shiny pony is worth the price. I cannot recall the Board of Trustees going before the Council asking for money on repairs, well maybe once or twice. It was always for expansion of programs. Why do the local schools walk to the Library? Who is liable for them if a car and pedestrian accident occurs since they are off school grounds; that would be very expensive for the town and may be deadly for the child. Walking is deadly? How many children have been killed on the sidewalks of Sierra Madre in all it’s history? None that I know of. At least so far. Sending them on long treks alongside Sierra Madre Boulevard could change that. Do you like taking chances with children's lives? Why do the school kids NEED to go to the library during school hours? Why can't their parents take them during non school hours? The kids who live in SM all live 10 minutes away by car. Answer: Less work for teachers and parents. Yes, 7:32, they may also get attacked by Big Foot during their walk, so they should be kept indoors. Race and gender identification - huh? I think that is what they will base their weighting on. Or so the agenda report says. I thought race was a non issue in Sierra Madre. Why even ask that or home ownership? I'm sure that kind of information is worth something to somebody. 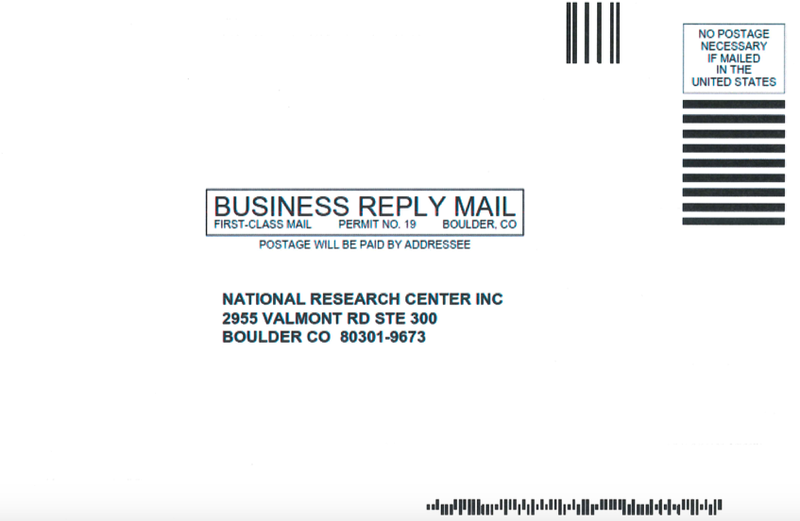 Does the NRC repackage and resell such data? Marketing companies love demographics, and here we're paying to make an opportunity happen. Please show up at the City Council meeting Tuesday evening (starts at 6:30), and have your questions, opinions ready. This is the best City Council we've ever had in the 30 years I've lived in Mayberry, and they DO listen. At the very least, email them. Identification: you forgot about; age. Is the board curious if seniors will try and take the elevator so that they can check out books? I recall a grandmother being hit and killed by an auto, pedestrian accident. It happened in front of the library when she was crossing the street with her grandchildren. He had overdue library books. Attention seeker. Should have done it in private in the middle of the Mohave Desert. I don't see SHUT IT DOWN? on the list. We are surrounded by Libraries, use Arcadia, Monrovia or Pasadena. Makes no sense to keep our very expensive library when there is no money to maintain water system. I haven't used a Library in years, and I read. I either get my books from Amazon or I go to Vroman's. The postcard makes moving the Library sound like a free ride. Shouldn't there be some actual concrete accounting for that? Pig in a poke, anyone? I would like to have a 19th century Library. One that just has books and newspapers. The lovely lady hit by the car was not crossing the street legally, and the driver was not charged because he was NOT speeding. Also to answer why children need a library during school hours. Parents both work or one parent works many jobs. newspapers, magazines, how to find information and for the JOY OF READING! PLEASE GO TO THE LIBRARY TO SEE MANY CHILDREN IN THE CHILDREN'S ROOM READING! I think this is important to be free to go and read a book, not a phone or computer! Plus, our library is located where there is safe walking on a sidewalk, and a lot of parking. and the walk there is unsafe for groups of children, or just one person! Keep our library. It is a gem in the city. Do not spend money building any more. Fix it, please. Just do the repairs and keep our library. Just because both parents work, it's not up to the rest of us to foot their bill. Can't take care of your kids needs.....don't have them. Life is more important than things. A house filled with fine possessions will never make up for the children you never had. But how would these parents afford the expensive cars that they need to out do the Jones ?!?!?!? They BOTH have to work. Oh wait, I may be describing residents in Arcadia, sorry. What a silly comment 7:32 about liability off school grounds. For years, SMMS students have been walking to SME for concerts and other performances, and perhaps with the new SMMS, SME students walk to SMMS for the same. 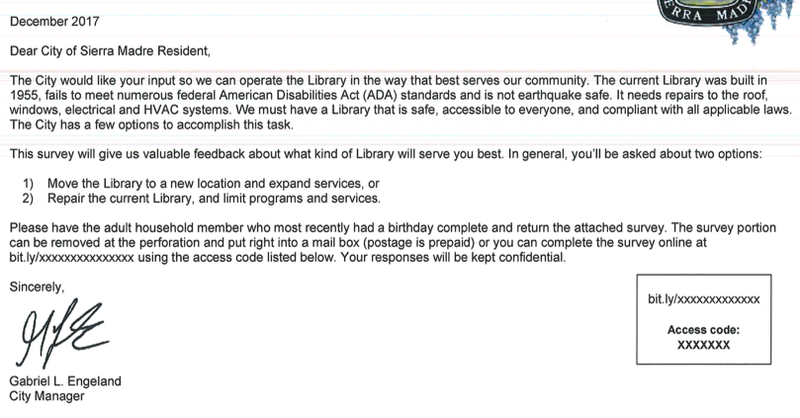 What does liability have to do with the location of the library? In loco parentis. Teachers are in charge of their students during school activities on campus and off. My actual observation is two fold: When did a project not have cost overruns? Why can't the CC chambers be used as Sierra Madre's presentation venue--the Senior Center uses is for noon movies or they did. Don't count on the YAC meeting earthquake standards. That was bult in a rush to co-opt funding from Prop A and other sources. One day I was in a class in the rec room and rain was running down the interior brick wall. The seal between the original roof and the newly added second story was/is defective. It is common knowledge that the elevator is dangerously shaky. Remaining completelt anonymous, I was on the Parks and Recreation Commission many years ago and brought to the attention of staff and other commissioners that my husband thought the hot water lines in the men's (therefore the women's, too) were wrapped in asbestos tape. I mentioned it at the next meeting and was met with disbelief and the concern was dismissed. At a later meeting there was a budget item for asbestos removal of the hot water pipes in the showering facilities at the pool! What else is there, not observed, not corrected? The City should have 3 estimates for repairing the Library and we should be able to see them. If there aren't 3 estimates then we don't know the truth of whats going on. Yes! That would help a lot. It's misleading for the library board to suggest that the options on the card are the only options. There are always alternatives. We need to put the Library on the ballot. Time to cut the crap. 7:32’s display of stupidity may be explained if he/she voted for Dump. Could be a genetic issue so we better give him/her a break. Huckabee sanders has her own spirit? So the city attorney can definitely say the town is off the hook if a child is hit, in or out of a crosswalk? The Pasadena schools in Sierra Madre all have signed release forms to leave the school campus during school hours? Why was the new school built without a library. I never walked to a library when I was a child in school; but we had recess back then. No need to tell us you never went to the library. Your misguided bs about liability already showed it. Life-long reader here, and I recognize that the technological revolution has changed more than a few institutions. Brick and mortar libraries are obsolete, except as charming monuments to older times. With access to the internet, all of human knowledge and experience is available. It's like comparing a rocket to a horse - no one can argue about the beauty and majesty of a horse, but it won't take you to Mars. It's foolish to go into debt for a dying institution. The only necessary function of the physical library is to provide ways for all citizens to use the non-physical one. Just shut the library down. Use the land for some other city purpose. Never sell the land. 12:18pm. Spoken like a true Library Board member, anything to keep the doors open and demand a parcel tax. Wonderful. Sounds like lots of drink in this little town that would be a city.